Gastric cancer (GC) and colorectal cancer (CRC) are found as double cancer most frequently for each other. Increasingly, laparoscopy-assisted gastrectomy (LAG) and laparoscopy-assisted colorectal (LAC) surgery are being performed. However, few have so far described a laparoscopic combined resection for synchrounous GC and CRC. Accordingly, surgical outcomes of this procedure were reviewed to clarify its feasibility. The laparoscopic combined resection is expected to reduce morbidity and achieve good cosmetic result. However, there are some limitations in this procedure. First, it is difficult to set appropriate positions of the working ports for both LAG and LAC operations. Secondly, the position and length of minilaparotomy is also arguable. Thus, we also investigate the possibility whether this surgical procedure could overcome such limitations. 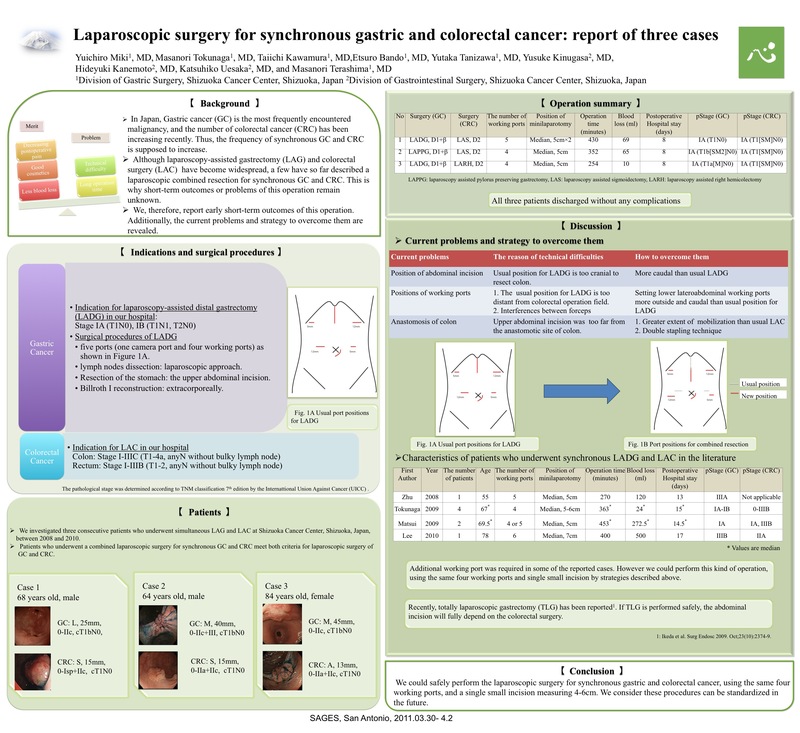 We investigated three consecutive patients who underwent simultaneous laparoscopy-assisted gastrectomy and colorectal surgery at Shizuoka Cancer Center, Shizuoka, Japan, between 2008 and 2010. In the present study, LAG was generally indicated for patients with cT1N0 GC. LAC was indicated in patients with CRC without bulky tumor (>8cm) or evident invasion to adjacent organs. In patients with synchronous GC and CRC that fulfill the criteria for LAG and LAC, laparoscopic combined resection was indicated. We collected clinicopathological findings, details of operative procedure, and early surgical outcomes. Early surgical outcomes were postoperative morbidity, mortality, and the duration of the postoperative hospital stay. At operations, we usually used five ports (one for video scope, the others for working) for both LAG and LAC. Basically, one small incision was made for retrieval of specimen and enteric anastmosis. All patients were diagnosed as T1N0 for both GC and CRC. Two patiens underwent sigmoidectomy in addition to distal or pylorus-preserving gastrectomy. The other patient underwent distal gastrectomy and right hemicolectomy. Mean operation time was 345 minutes, and estimated blood loss was 48 mg. Intraoperative complication was not found in any patients. As for the first case, one additional port was required, and two separate small incisions were made. However, for the latter two cases, we performed the operations using same four working ports, and a single small incision measuring 4-6cm in length was sufficient. These alterations could be achieved by some modifications, such as the lower position of minilaparotomy than LAG or broader mobilization of colon than LAC. Postoperative morbidity and mortality was not observed in any of the patients. All three patients recovered well, and discharged at 8th postoperative day. All surgeries were pathologically curative resection. No intraoperative and postoperative troubles were observed in three patients who underwent laparoscopic combined resection of GC and CRC. This approach represents a feasible and effective option as minimally invasive treatment of synchronous GC and CRC. If the procedure was modified appropriately, LAC and LAG with same working ports and single small incision could be performed.